Question 1. An object has moved through a distance. Can it have zero displacement ? If yes, support your answer with an example. Answer. Yes, it can have zero displacement. Explanation : If we take a round trip and reach back at the starting point, then we have traveled some distance, but our displacement will be zero. Question 2. 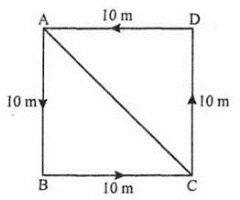 A farmer moves along the boundary of a square field of side 10 m in 40 s. What will be the magnitude of displacement of the farmer at the end of 1 minutes 20 seconds ? Question 3. Which of the following is true for displacement? (a) It cannot be zero. (b) Its magnitude is greater than the distance traveled by the object. Neither (a) nor (b) is true. Question 4. 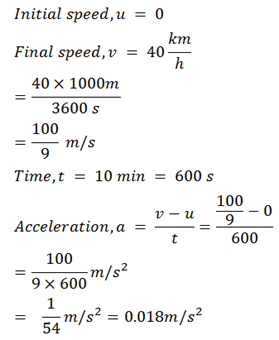 Distinguish between speed and velocity. 1. The distance traveled by a moving body per unit time is called its speed. 2. Speed is a scalar quantity. 1. The distance traveled by a moving body in a particular direction per unit time is called its velocity. 2. velocity is a vector quantity. Question 5. 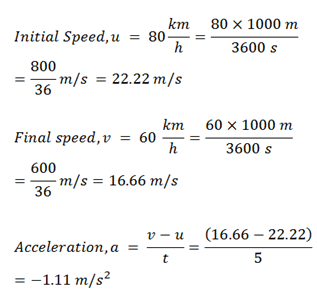 Under what condition (s) is the magnitude of average velocity of an object equal to its average speed? When an object moves along a straight line in the same direction, its total path length is equal to the magnitude of displacement. Hence, its average speed is equal to the magnitude of average velocity. Question 6. What does the odometer of an automobile measure? The odometer of an automobile measures the distance moved by it. Question 7. What does the path of an object look like when it is in uniform motion? Question 8. During an experiment, a signal from a spaceship reached the ground station in five minutes. What was the distance of the spaceship from the ground station ? The signal travels at the speed of light, that is, 3 108 m/s. If a body travels in a straight line and its velocity changes by equal amounts in equal intervals of time, however small these time intervals may be, then the body is said to be in uniform acceleration. If the velocity of a body changes by unequal amounts in equal intervals of time, then the body is said to be in non-uniform acceleration. Question 10. A bus decreases its speed from 80 km/h to 60 km/h in 5s. Find the acceleration of the bus. Question 11. A train starting from the railway station and moving with a uniform acceleration attains a speed of 40 km/h in 10 minutes. Find its acceleration. Question 12. 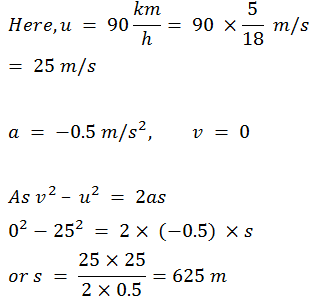 What is the nature of the distance time graphs for uniform and non-uniform motion of an object? (ii) For non-uniform motion, the distance-time graph is a curve. Question 13. What can you say about the motion of an object whose distance-time graph is a straight line parallel to the time axis? The object is at rest. Question 14. What can you about the motion of an object if its speed-time graph is a straight line parallel to the time axis? The object is moving with a uniform speed. Question 15. What is the quantity which is measured by the area occupied below velocity-time graph? Distance covered by the body in the given time interval. Question 17. A train is traveling at a speed of 90 km/h. Brakes are applied so as to produce a uniform acceleration of-0.5 ms-2. Find how far the train will go before it is brought to rest ? Question 18. A trolley while going down an inclined plane has an acceleration of 2 cms-2. What will be its velocity in three seconds after start ? Question 19. A racing car has a uniform acceleration of 4ms-2. What distance will it cover in 10 s after start ? Question 20. 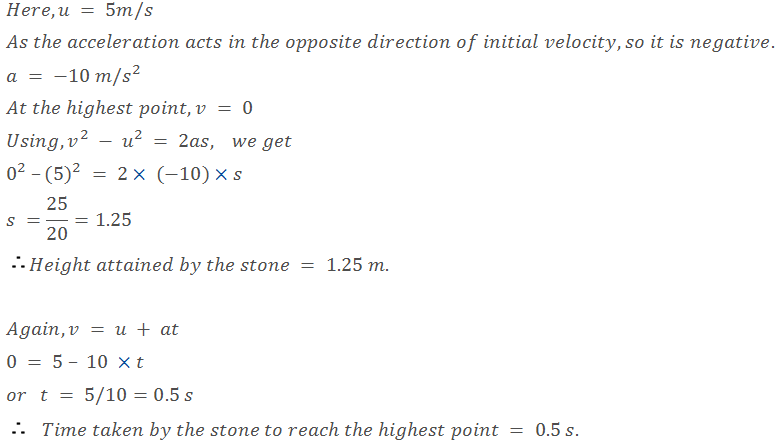 A stone is thrown in a vertically upward direction with a velocity of 5ms-1. If the acceleration of the stone during its motion is 10ms-2 in the downward direction, what will be the height attained by the stone and how much time will it take to reach there? Question 21. An athlete completes one round of a circular track of diameter 200 m in 40 s. what will be the distance covered and the displacement at the end of 2 minutes 20 s? Question 22. Joseph jogs from one end A to the other end B of a straight 300 m road in 2 minutes 30 seconds and then turns around and jogs 100 m back to point C in another 1 minute. What are Joseph’s average speeds and velocities in jogging (a) from A to B and (b) from A to C? Question 23. Abdul, while driving to school, computes the average speed for his trip to be 20/km h.On his return trip along the same route, there is less traffic and the average speed is 30 km/h. What is the average speed for Abdul’s trip? Question 1. Who discovered cells, and how? Robert Hooke discovered cells. In 1665 under self-designed microscope, he examined a thin slice of cork. The cork resembled the structure of a honey comb consisting of many little boxes. These little boxes were termed cells by Hooke. Cell is a Latin word which means “a little room”. Question 2. Why is the cell called the structural and functional unit of life? All living organisms are composed of cells. Each cell has several cell organelles which perform a specific function for the cell. Its an example of division of labour within the cell. In all organisms all cells have the same cell organelles. Thus cell has a basic structural organization and is the basic functional unit. Question 3. How do substances like CO2 and water move in and out of the cell? Discuss. Movement of CO2: Substances like CO2 and oxygen move in and out of the cell through plasma membrane by diffusion. When concentration of CO2 is low outside the cell, CO2 moves out of the cell by diffusion and vice versa. Movement of water is affected by amount of substance dissolved in water. Water moves from a region of high water concentration to a region of low water concentration by osmosis. Question 4. Fill in the gaps in the following table illustrating differences between prokaryotic and eukaryotic cells. Question 5. Can you name the two organelles we have studied that contain their own genetic material? Mitochondria and plastids have their own genetic material and ribosomes. Question 6. If the organization of a cell is destroyed due to some physical or chemical influence, what will happen? In case of any physical or chemical injury to the cell, lysosomes become active. They burst and their digestive enzymes digest the whole cell. Ultimately the cell will die. Question 7. Why are lysosomes known as suicide bags? Lysosomes are cell organelles which contain digestive enzymes capable of breaking down all organic materials. In case of any damage to the cell, lysosomes burst releasing the enzymes which digest the other cell organelles and finally the whole cell. So, they are called “suicide bags”. Question 8. Where are proteins synthesized inside the cell? In a cell, ribosomes are the site of protein synthesis. Rough endoplasmic reticulum has ribosome particles attached to its surface. Ribosomes are also present in Mitochondria and Plastids, so these organelles. also have their own protein synthesis machinery . Thus site of protein synthesis in a cell are — RER, Mitochondria, Plastids and Nucleus. All living organisms are composed of cells which are the structural and functional units of life. Although the cells are similar in structure and function in all living organisms, plant cells are different from animals cells in some respects. A comparative study of plant and animal cell shows the presence of plasma membrane, cytoplasm with cell organelles like endoplasmic reticulum, golgi apparatus, lysosomes, vacuoles, mitochondria etc. Nucleus with nuclear membrane and chromatin material is also seen. Cell wall is a absent. (iii) Large sized vacuoles are present which provide rigidity and turgidity to the cell. Question 10. How is a prokaryotic cell different from an eukaryotic cell? On the basis of presence or absence of a well organised nucleus, cells are of two types-Prokaryotic and Eukaryotic. (i) Lacks well organised nucleus surrounded by nuclear membrane. Such a nucleus is called nucleoid. (ii) Membrane-bound cell organelles is absent. (iii) More than one chromosome present. Question 11. What would happen if the plasma membrane ruptures or breaks down? Presence of plasma membrane is so crucial for a cell that we can’t even imagine the existence a cell without it. In case of any damage to the plasma membrane, the cellular metabolism get disturbed. Lysosomes become active and they burst. Their digestive enzymes digest the other cell organelles and finally the whole cell i.e., the cell suicides. Question 12. What would happen to the life of a cell if there was no golgi apparatus? In the absence of golgi apparatus the transport of proteins and lipids synthesized near rough and smooth endoplasmic reticulum inside and outside the cell will stop. The essential materials synthesized inside the cell will not reach to the target where they are required. So the various activities carried out by different parts of the cell will be affected. Other functions of the cell like storage and packaging of products by vesicles and formation of complex sugars will also affected. Lysosomes would not be produced and bacteria could attack and destroy the cell as there will be no digestive enzymes of lysosomes to break them. Question 13. Which organelle is known as the power house of the cell? Why? Mitochondria is also known as the power house of the cell because here energy rich compound ATP or adenosine triphosphate is produced which is required by body to carry out various metabolic activities. Question 14. Where do the lipids and proteins constituting the cell membrane get synthesised? The lipids and proteins constituting the cell membrane get synthesised in endoplasmic reticulum present in cytoplasm. Rough endoplasmic reticulum containing ribosomes synthesise proteins while smooth endoplasmic reticulum synthesise lipids. The process of building cell membrane with those lipids and proteins is called ‘Membrane Biogenesis. Question 15. How does an Amoeba obtain its food? The flexible nature of cell membrane helps unicellular Amoeba to engulf food by the process called endocytosis. 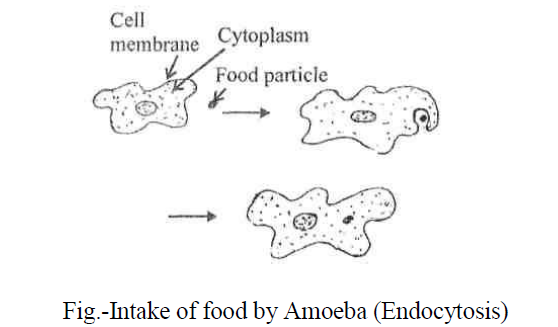 Whenever, Amoeba comes in contact with a food particle, its cell membrane along with cytoplasm grows in that direction. Finally it surrounds the food and make it a part of its cytoplasm. Question 16. What is osmosis? The movement of water through a selectively permeable membrane from a region of high water concentration to a region of low water concentration is called osmosis. It is a kind of diffusion, eg. unicellular fresh water organisms and plant roots absorb water by osmosis. Entry of water in a cell is called endosmosis, movement of water outside the cell is called exosmosis. (d) Put one teaspoon sugar in the boiled potato cup D.
(i) Explain why water gathers in the hollowed portion of B and C.
(ii) Why is potato A necessary for this experiment? To show that when the concentration a same on both sides, there is no movement of water. (iii) Explain why water does not gather in the hollowed out portions of A and D.
The water does not gather in cup A due to the same concentration of solution. The water does not gather in cup D bee; boiling kills the cells and dead cells are unable to absorb water by osmosis. Question 18. Why is the plasma membrane called a selectively permeable membrane? Plasma membrane permits the entry and exit of some materials in and out of the cell. It also prevents movement of some other materials. There for, the plasma membrane is called selectively permeable membrane.